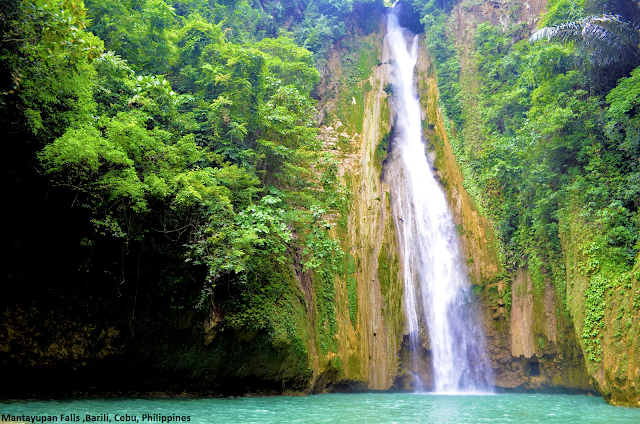 Mantayupan Falls is a famous natural waterfalls resort located in Barili Municipality, Cebu Province, Philippines.Mantayupan Waterfall, one of the top tourist attractions in this municipality, Mantayupan Falls is actually made up of two levels. The first one has three cascading waters, the highest of which is around 14 meters. Meanwhile, the second level has a waterfall reaching up to 98 meters high. The water of this waterfall irrigates the rice paddies down below of Barangay Campanga. So, it is really fully utilizing its giftedness as both nature’s beauty and life-support for the residents. You can take a dip in its cold waters but you will have to be careful as it can immediately go deep without warning. If swimming isn’t what you feel like doing, you can always take a break and sit down on any of the picnic tables near the waterfalls. You can either buy food for the numerous mini food stalls inside the park or you can opt to pack your own food or even cook it there. Puwede ra mu sulod mam/sir bisag dili lang maligo just exploring the View lang?